A while back I sent in an ray tracing IOTD showing the Stanford bunny, rendered at high speed. I've been busy since I made that demo, and these shots show the current state of the art. The top shot represents the maximum image quality: There are textures, adaptive super sampling (for edge anti aliasing), a bloom filter causing a subtle glow and of course the reflections. Sadly all this eye candy comes at a cost. 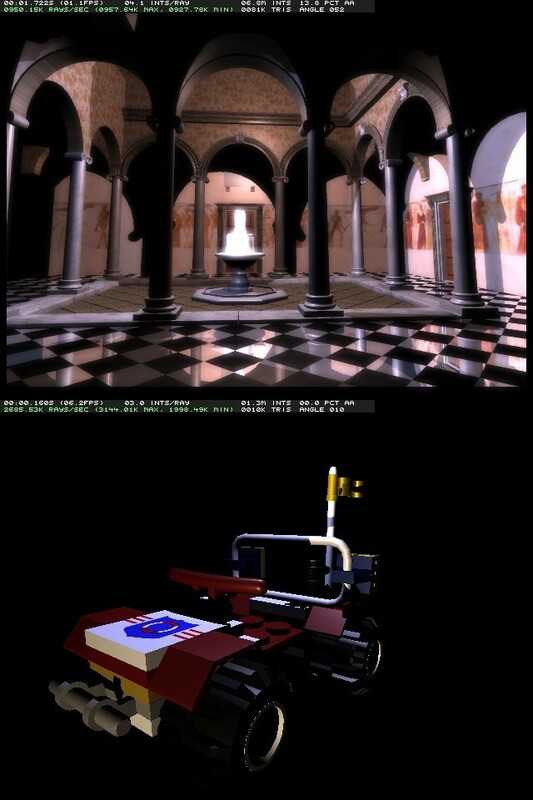 The lower shot shows a very good performing model: The number of rays per second is no less than 3 million on a 1.7 Pentium-M - on a P4 @ 3.2Ghz this would be about 6 million rays per second, which is better than the SaarCOR FPGA ray tracing chip. Over the past months, many things have improved: The overall speed of the ray tracer has been improved considerably due to some stiff competition from tbp (the odd french dude), there's a complete tool chain now to get from downloaded content to ray traced images (via the .obj file format), and the functionality has been extended considerably (textures, reflections, HDRI, networked rendering etc.). There will be more good stuff, I'll keep you all informed. Greets - Jacco.